Grilled Cheese Roll-Ups present a classic dish in a fun new package! Great for kids and adults alike, Grilled Cheese Roll-Ups are delicious on their own or dunked into a bowl of tomato soup. With rolling pin, flatten bread slices to ¼-inch thickness; top each with cheddar. Roll up tightly. Melt 2 tablespoons butter in a large skillet over medium heat. Cook roll-ups, in batches, for 3-4 minutes, turning until sides are golden brown. Add remaining butter as necessary. Serve immediately. Wow your guests with this zippy appetizer featuring spicy buffalo flavor and delicious, creamy mac and cheese. The winning combination of sharp cheddar, creamy brick, and rich blue cheese gives these bites a tangy flavor, while hot pepper sauce adds some heat. Cool down these bites with a creamy homemade sour cream dip served on the side! Cook pasta according to package; drain. Meanwhile, melt 2 tablespoons butter in a small skillet over medium-low heat. Add 1 garlic clove; cook and stir for 1 minute. Stir in Panko bread crumbs; toss to coat. Remove from heat. Stir in 1 tablespoon each parsley and dill. Set aside. Melt remaining butter in a Dutch oven over medium-low heat. Whisk in flour until smooth. Add remaining garlic clove; cook and stir for 1 minute. Gradually whisk in milk, cream, hot pepper sauce, and 1 teaspoon ranch salad dressing mix. Bring to a boil; cook and whisk for 2 minutes or until thickened. Reduce heat to low; gradually stir in brick and cheddar until melted. Season with salt and pepper to taste. Remove from heat. Whisk ¼ cup hot cheese sauce into eggs in a bowl. Return all to pan, whisk to combine. Stir in pasta. Divide pasta mixture into 48 greased mini muffin cups; press down gently. Sprinkle with blue cheese and reserved bread crumb mixture. Bake for 20-25 minutes or until a thermometer reads 160 degrees Fahrenheit and pasta is lightly brown and bubbly. Led stand 10 minutes in pans before serving. Combine sour cream with buttermilk. Season with remaining parsley, dill, and ranch salad dressing mix to taste. 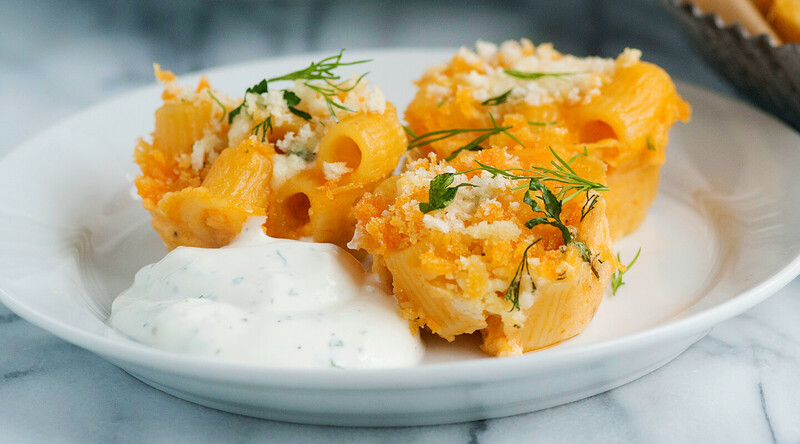 Serve with mac and cheese bites. Kick it up a notch with this Chicken, Cheddar, and Pepper Jack Pizza! 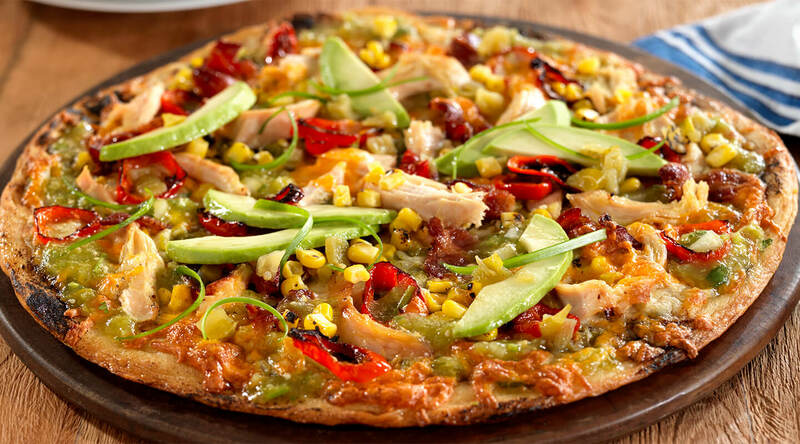 Featuring Southwest flavors of corn, avocado, and tomatillo salsa, spicy pepper jack brings the heat to this unique pizza, while Cheddar cheese helps keep it balanced. Place pizza crust on a baking sheet; brush with olive oil. Spread tomatillo salsa over crust to ½ inch of edges. Top with cheddar, chicken, corn, and green chilies. Sprinkle with pepper jack. Bake for 10-12 minutes or until cheeses are melted. Layer with avocado and green onion. Top with red peppers, bacon, and cilantro if desired. 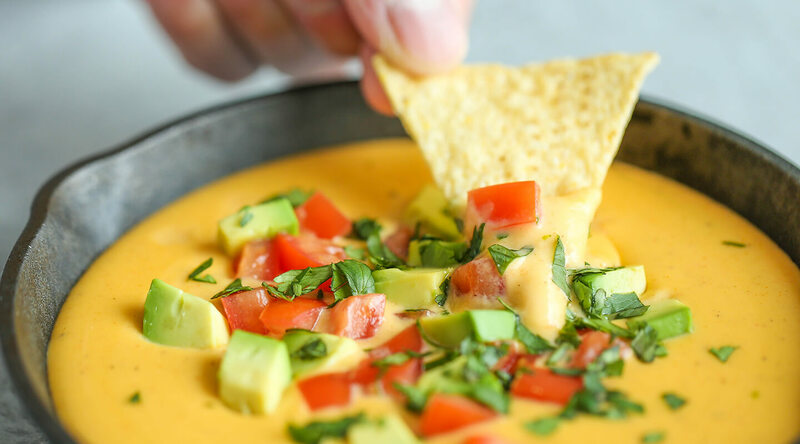 Skip the store bought stuff and whip up a batch of this easy nacho cheese! This easy 10 minute recipe will wow you with flavor. Serve with a bag of your favorite chips for a quick, easy, and delicious snack! Melt butter in a large saucepan over medium-low heat. Whisk in flour until lightly browned, about 1 minute. Gradually whisk in cream, milk, and spices. Bring to a boil; cook and whisk for 2 minutes or until thickened. Reduce heat to low; gradually stir in cheddar and Colby until melted. Remove from heat. Stir in chilies. Season with salt and pepper to taste. Add milk if sauce is too thick, a tablespoon at a time. Serve immediately with chips. Grilled cheese fit for a king! 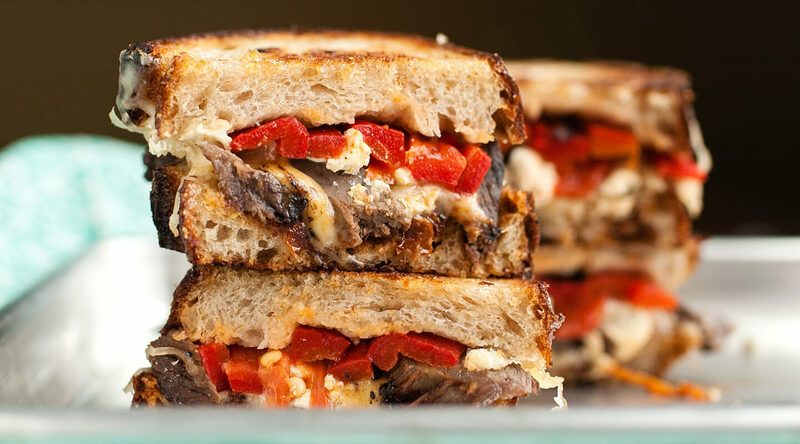 With thin strips of sirloin steak, roasted red pepper, two kinds of cheese, and a hot chili sauce, this sandwich is savory, spicy, and all around delicious. Brown the sourdough bread to perfection, and enjoy! Saute steak in oil in a large skillet until no longer pink. Remove beef from pan; drain. Layer six slices of bread with ¼ cup provolone, steak, and red peppers. Sprinkle with the remaining provolone and 2 tablespoons feta cheese. Drizzle 1 teaspoon Sriracha sauce on each over the cheese. Top with remaining bread slices. Spread the outsides of sandwiches with butter. Toast sandwiches on an electric griddle or in a warm skillet over medium heat for 4-5 minutes on each side or until bread is lightly golden brown and cheese is melted.